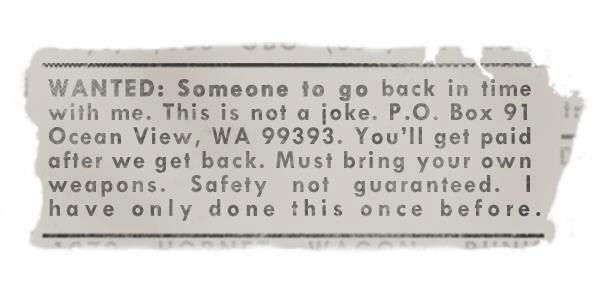 In 1997, in the early days of Backwoods Home Magazine ( a little publication out of of Gold Beach, Oregon), the publisher used fillers when the classified ad pages came up short. He’d ask one of the writers, John Silveira, to come up with jokes or something. One night, desperate to wrap up the classifieds, he asked John for a couple of jokes. Instead John offered to place a couple of humorous fake ads. The publisher agreed. He expected to get maybe three or four responses from friends. Instead, he received more than a thousand, with his PO Box overflowing.. Yes I want to time travel to 1984. My time machine was stolen and I am stuck in 2010. Thank you. How are we going to go? Why is it dangerous? Why do we need weapons? What kind of weapons should I bring? Will there be toilet paper or should I bring my own? Yet, overwhelmingly, many letters came from people who wanted to correct a past mistake that they regretted. Now we all know that there is no such thing as time machines. But, what if, what if there was a way to overturn the events of the past, to change history. they shall confess the sin they committed, and make restitution for the principal amount of his guilt, add its fifth to it, and give it to the one against whom he was guilty. Noam Elimelech asks what is "act treacherously against Hashem" "לִמְעֹל מַעַל ה"
The Midrash (Bamidbar Rabba 8) understands this verse as referring to not only one who actually commits a transgression, but also one who merely contemplates sin: "…who considered committing [a sin] but did not commit; this teaches you that from the moment a person considers sinning it is as if he has betrayed Hashem." Next, "and that person is [found] guilty" "וְאָשְׁמָה הַנֶּפֶשׁ הַהִוא" - means one should hold no doubt, and look at themself as absolutely guilty. Next, "they shall confess the sin they committed" "וְהִתְוַדּוּ אֶת חַטָּאתָם אֲשֶׁר עָשׂוּ" means to confess everything in detail. Next, "make restitution for the principal amount of his guilt" "וְהֵשִׁיב אֶת אֲשָׁמוֹ בְּרֹאשׁוֹ" - to do tshuva, straight to the top. For the main act of tshuva (תשובה) is to go back to Hashem (תשוב ה). In Tshuva, we learn many laws, especially to confess ones transgressions verbally (Yoma 86-87). The Sefer HaHinuch lists Vidui as Mitzvah. That in the moment of doing Tshuvah - Ana Hashem Hatati, Iviti, vPeshati ... That, that is you need to actually state the action explicitly. Why did the Torah command us to pronounce our wrongdoings? Says the Sefer HaHinuch, this is because a full oral vidui greatly strengthens one's determination to improve in the future, and will help in maintaining the process of teshuvah. The thoughts and intentions of the sinner are fully revealed, showing that he honestly wants to reveal all of his actions to Hashem. Even though this is a private and personal announcement, by formulating this out loud one will be more careful next time he may be tempted. Nazir - Preferred Way or Sinner? Rashi asks what is "כִּי יַפְלִא"? It means to "set oneself apart"
Says Rashi from a Gemarah in Sotah [2a], why is the section dealing with the Nazir juxtaposed to the section of the adulterous woman? To tell us that whoever sees an adulteress in her disgrace should vow to abstain from wine, for it leads to adultery. When a person takes vows in order to establish his character traits and correct his conduct, he is considered eager and praiseworthy. If a person was a glutton and [took a vow] forbidding meat for a year or two. Says the Rambam, all of these are paths in the service of Hashem and concerning such vows and the like chachamim said: "Vows are a safeguard for restraint." R. Eleazar ha-Kappar, Berabbi, said: Why does the Torah say, And make atonement for him, for that he sinned (חָטָא עַל הַנָּפֶשׁ) by reason of the soul. Against what 'soul' did he then sin? It can only be because he denied himself wine. If then this man who denied himself wine only is termed a sinner, how much more so is this true of one who is ascetic in all things! The Slonimer Rebbe says that there seems to be a contradiction. One the one hand the Rambam seems to praise taking actions of denial, while the Gemara in Nazir states explicitly that denying oneself these things is considered a sinner. Asks the Slonimer Rebbe in Netivot Shalom, when the question comes before someone for which way to take in how to serve Hashem - whether to distance oneself from all of this world's material or to still engage the pleasures of this world and to elevate them to Hashem - what is preferable? Says the Rebbe, the purpose of creation and the life of serving Hashem is that a Jew should elevate all his material efforts for Hashem. This will connect the lower things to the higher. Even though it looks like the approach of distancing oneself from this world is the easier way to connect to higher things. Nevertheless the even higher level is to elevate this world to Hashem, and that is the desirable purpose. Thus, the concepts in this parsha are presented specifically in the order that they appear. First, the basic level, parshat Nazir takes the ascetic path, then we go even higher with the Priestly blessings and the Parshat Hanissiim - for these are both about elevating the material elements of this world to Hashem. Shavuot is "return" and "renewal." When G-d gave the Torah, He, so to speak, changed His nature and became accessible to the world ... but it was on the condition that the Jews also change their nature and become accessible to Him and His Torah. This is the same message as tshuva--"return"--because it really means returning to our origin and totally renewing our being. There are two holidays mentioned in the Torah whose primary significance is not explicitly mentioned. Nowhere in the Torah is Rosh Hashanah described as the Day of Judgment. Likewise, Shavuot is not referred to in the Torah as Chag Matan Torah. the date of the arrival of mashiach. The reason for all of these being ambiguous is the same, says The Kli Yakar. Being in doubt forces us to think differently. Not knowing when mashiach will come can drive us to repent constantly in order to merit his arrival. Not knowing when one will die also can lead one to repent constantly in preparation for the Great Judgment. Not knowing when the Day of Judgment (Rosh Hashanah) is prevents us from sinning all year long, when it is seemingly safe to do so, and planning to repent at the last moment. Finally, not knowing the date of Matan Torah allows us to feel every day as if the Torah is new. While we don't have access to actual time machine, nevertheless we have been given the tools for addressing our past actions, and even turn our faults to merits. With Shavuot, upon us, we have an opportunity to step back in time and to re-experience Matan Torah and renew for ourselves our commitment and enthusiasm for Torah. And I can say with a reasonable amount of certainty that here, your safety, your safety will be guaranteed. May this Shavuot bring new blessings of renewal, return and revelation . . .